In a living room in New Delhi recently, I spoke to a group of parents and prospective students about the global character of Brandeis today. I told them about our student body, hailing from 116 countries; about how more than half of our undergraduates study or work outside the United States before graduation; and about our hundreds of faculty collaborations with overseas research partners. I could see that the parents in the room were impressed; the young people in the room, however, were much less dazzled. It was not that they dismissed the international character of the university they hope to attend. Quite the contrary. It is that today’s young people cannot imagine a first-class university that is not truly global. Simply being “global” is not a particular mark of distinction anymore. It is a fundamental element of any university that aspires to be among the best. The challenge for Brandeis is determining how to pursue our international connections for maximum impact and at the highest level of quality. Global engagement per se is no longer exceptional. Being exceptional will require careful strategic thinking about our particular advantages and opportunities in the global arena. Twenty students from the International Business School headed to Cuba over February break to get a firsthand look at a socialist economy in transition. A new multiyear grant from the Bronfman Foundation provides faculty from across the university with opportunities to explore research partnerships with their counterparts at Israeli universities. Undergraduate students staff medical clinics in East Timor, run conflict resolution workshops in Costa Rica, and establish camps for children in Haiti and Rwanda. A Brandeis center continues to convene the world’s only permanent institute for judges who serve on international courts and tribunals. A physicist crosses geographical and disciplinary lines to work with colleagues in the life sciences in Bangalore, India. Faculty and students from the Heller School work together to study whether treating wallpaper liners with insecticide can reduce instances of malaria in Africa. I have led two delegations on international trips since becoming president, to Israel in June 2011 and to India in February 2012. Each trip included meeting with alumni, parents of students, and prospective students, and with academic colleagues who look forward to collaborating with Brandeis faculty. And each trip has already resulted in funding to support further initiatives involving these countries. We are justly proud of our accomplishments in the global arena to date. But if we are to keep pace with the expectations of our students and take full advantage of the opportunities that globalization offers us, we will have to redouble our efforts as a global university. After all, we are competing for the best students with more universities than ever before, not just in the United States but in places like China and Singapore, which are pouring money into higher education. To cope with the challenge, we must be ever mindful of who we are — and who we are not. We must seek engagements of a scale and orientation that keep us resolutely Brandeisian. We do not need to build massive and expensive campuses overseas, nor should we be filling file drawers with feel-good but empty agreements. For Brandeis, a global strategy that takes full advantage of our strengths and scale will pay special attention to a small number of countries where we can have special impact: Israel, India and perhaps other emerging powers like Brazil and Korea. It means harnessing our efforts for maximum productivity by staying nimble and establishing a limited number of sustained partnerships with other dynamic institutions — universities, nongovernmental organizations and businesses — that can help amplify our strengths. The universities that will thrive in the coming decades will leverage creative partnerships and the innovative use of technology. They will succeed by developing learning modes for students that respect their mobility, their curiosity and their ability to gather information from diverse sources. Most importantly, we need to align our global engagement with our fundamental values. Our newly hyperconnected world is fragile, unstable and unequal. 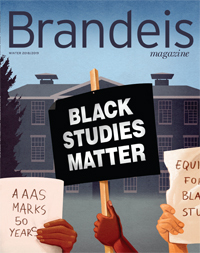 Brandeis can and must take a leadership role in using the knowledge we discover and disseminate to make this not only a more connected world, but a safer and more just world. Tikkun olam, repairing the world, is not a domestic project — it is truly and fundamentally global.